Jesus, Your High Priest, is the one Mediator in the Most Holy Place of the heavenly sanctuary. Prophecy foretold when He would be anointed to begin His ministry for His Church and when He would begin His final judgment and atonement for His people. Yes, you have a High Priest! He’s pleading your case right now before the God of heaven. You are so fortunate. There are millions who don’t know he is ministering for them, and many who don’t care, but you are so blessed. 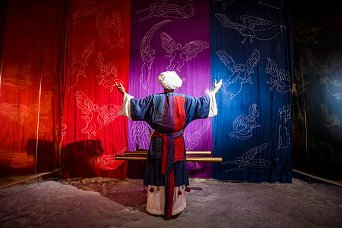 Your High Priest is the only being in the entire universe who really knows the Ancient of Days (Matt 11:27), the Judge now deciding your case in the court of heaven. But your Advocate is well able to defend you before the prosecution, who accuses you day and night before the deliberating jury. Your Mediator has secured an acquittal acceptable to the Judge and jury. But there are conditions. It was arranged with the stipulation of a plea bargain. You must agree to surrender your old life and accept a transformation, free if you accept it. Your High Priest offers you a substitute—his own life in place of yours. This life was the life he lived without a trace of error or imperfection by allowing the life of his Father to live in him. Now he offers to live in you and give you the same perfect error-free life. So simple. So powerful. So wonderful. Your High Priest became the High Priest for this world 20 centuries ago after dying for every person that ever lived and will ever live. Because he lived a perfect life without one selfish act or thought, his Father, the Sovereign of the universe, restored his life and inaugurated him as High Priest for the human race. For over 18 centuries he has been representing all who come to him, obtaining their pardon, and dispensing his powerful, victorious life to all who desire it. The Bible has a lot to say about your High Priest. The book of Hebrews assures us that “we have a great high priest, that is passed into the heavens, Jesus the Son of God” Hebrews 4:14. Jesus, the Son of God, is your great High Priest. He is now in heaven after living a life here on earth as the Son of man that he might “be touched with the feeling of our infirmities” and “tempted in all points like as we are” Heb 4:15. This was “in the days of his flesh, when he had offered up prayers and supplications with strong crying and tears unto him that was able to save him from death”, his Father. Hebrews 5:7. But there was no other way. Only one being in all the universe could redeem mankind: one who was equal with God (Phil 2:6) and equal with Man, the second Adam (1Cor 15:45). The Word of God, who proceeded forth from God (John 8:42), who came out from God (John 16:27,28; 17:8) was in the form of God (Phil 2:6) because God was his Father (John 5:18) and he was the Son of God. Then the Word became flesh (John 1:14) and was made a little lower than the angels (Heb 2:9). “He also himself likewise took part of the same…flesh and blood” (Heb 2:14) “in all things…made like unto” us (Heb 2:17). And because “he himself has suffered being tempted, he is able to help them that are tempted” (Heb 2:18) because he is the Son of man. So, the Father Who “said unto him, Thou art my Son, today have I begotten thee” (Heb 5:5) also said unto him, “You are a priest forever after the order of Melchisedec” (Heb 5:6), “king of Salem, priest of the most high God” (Heb 7:1), who “made like unto the Son of God; abides a priest continually” (Heb 7:3) because there is no record of his birth or death in the book of Genesis. 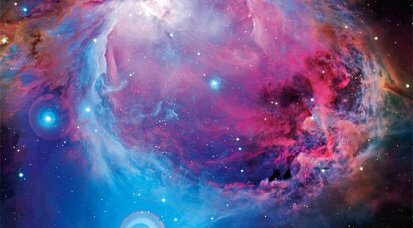 So also, Jesus was “made…after the power of an endless life” (Heb 7:16). “Wherefore he is able also to save them to the uttermost that come unto God by him, seeing he ever lives to make intercession for them” (Heb 7:25). We have an intercessor! Therefore, “We have such an high priest, who is set on the right hand of the throne of the Majesty in the heavens; a minister of the sanctuary, and of the true tabernacle, which the Lord pitched, and not man” Heb 8:1,2. The Sanctuary in heaven is the real deal. Moses was instructed to make one on earth “a copy of the pattern” in heaven (Exodus 25:8,9). 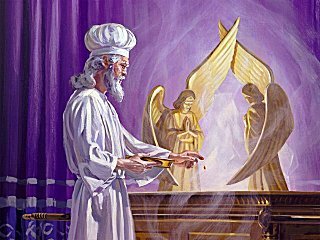 After Jesus returned to heaven and began his work in the true tabernacle as our High Priest the temple in Jerusalem was utterly destroyed as predicted by Daniel and Jesus. The angel Gabriel told Daniel “the people of the prince that shall come shall destroy the city and the sanctuary; and the end thereof shall be with a flood, and unto the end of the war desolations are determined” Daniel 9:26. Jesus said, as he left the temple for the last time, “Behold, your house is left unto you desolate” Matthew 23:38. Then he warned his disciples, “When you therefore shall see the abomination of desolation, spoken of by Daniel the prophet, stand in the holy place,..Then let them which be in Judaea flee into the mountains” (Matt 24:15-16). 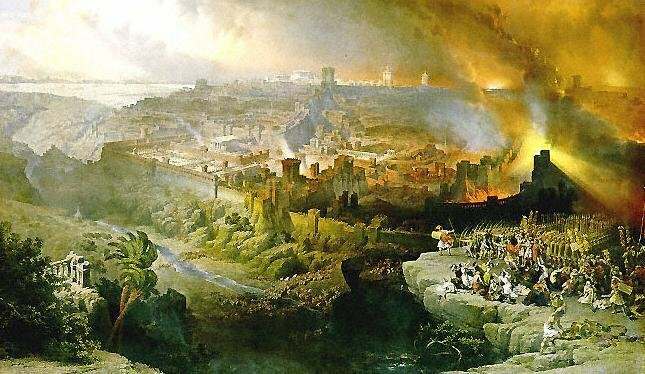 In 70 AD a Roman army under Titus besieged the city of Jerusalem and ultimately breached the walls, burned the temple, completely disassembling every stone to retrieve the molten gold. 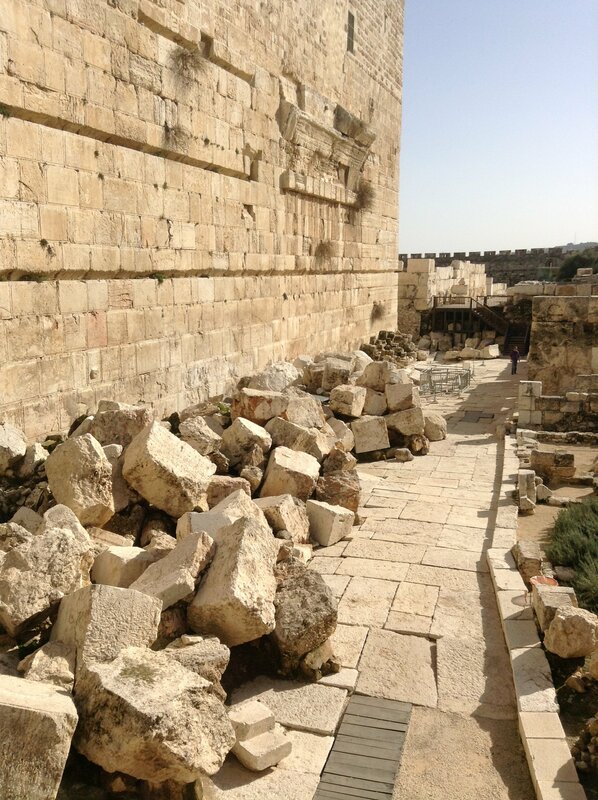 Today those great stones still lie in a heap at the base of the western wall. That temple is still left desolate. 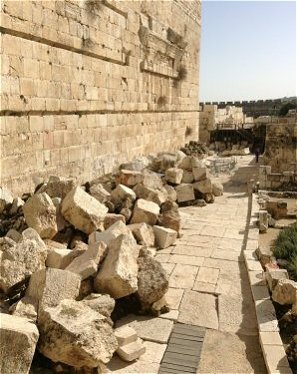 Daniel’s prophecy also foretold the restoration of the temple. 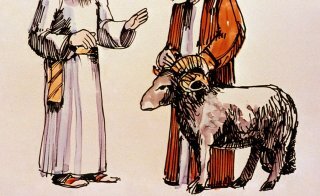 After seeing a head-on collision between two sacrificial animals (a one-horned goat and a two-horned ram) a mysterious proclamation was made, “Unto two thousand and three hundred days then shall the sanctuary be cleansed” Daniel 8:14. Why would the sanctuary need to be cleansed? The answer to this question is found in the once a year ceremony known as the Day of Atonement. In ancient Israel “that day shall make an atonement for you, to cleanse you, that you may be clean from all your sins before the LORD” Leviticus 16:30. 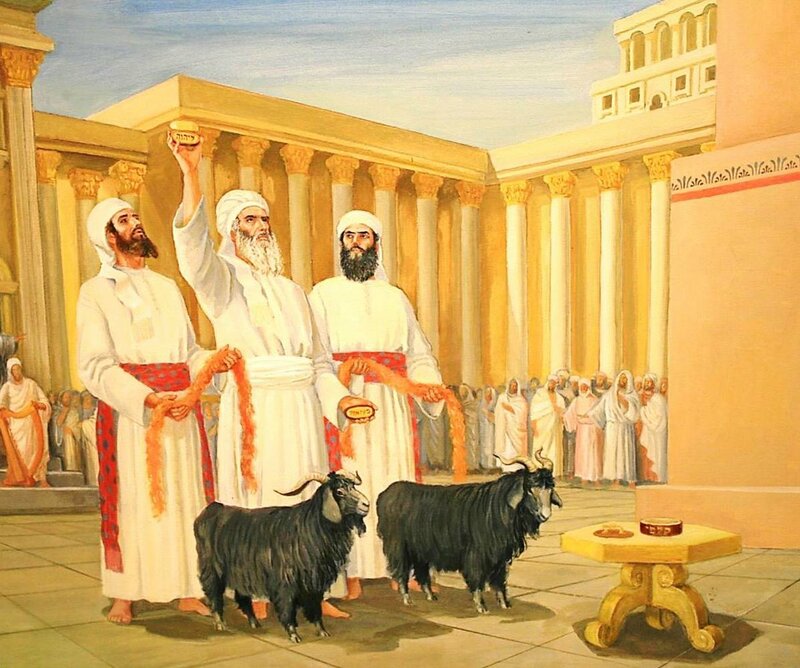 Throughout the year, day by day, those who were convicted by the Spirit of God that they had sinned by breaking the law of God could come to the temple with a lamb offering, confess their sin, place their hands on the head of the sacrifice and transfer their sin to the substitute which then died for them. After the repentant sinner transferred his sin to the head of the lamb, he had to kill his substitute with his own hands. Cutting its throat, the blood was collected, taken by the priest into the first apartment of the sanctuary and sprinkled on the veil that separated the holy place from the most holy place. 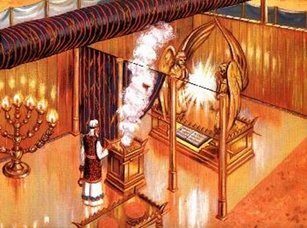 Behind that veil was the Ark of the Covenant and inside lay the law of God. The blood sprinkled before the law represented the life of the sinner who had broken that law. Day after day the evidence of sin paid for by the life of a substitute was transferred to the sanctuary until finally in the seventh month, a sabbath of rest came for the sanctuary. The slain lamb was each day burned on the altar in the courtyard as the Lamb of God would one day die outside the city. “For the bodies of those beasts, whose blood is brought into the sanctuary by the high priest for sin, are burned without the camp. Wherefore Jesus also, that he might sanctify the people with his own blood, suffered without the gate.” Heb 13:11,12. This was the atonement of Christ’s death on the cross “Who his own self bare our sins in his own body on the tree” 1Pet 2:24. But on the 10th day of the 7th month the final atonement was made. The High Priest officiated on this day while the other priests conducted the daily sacrifice. 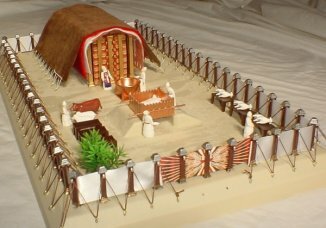 “And he shall make an atonement for the holy sanctuary, and he shall make an atonement for the tabernacle of the congregation, and for the altar, and he shall make an atonement for the priests, and for all the people of the congregation” Leviticus 16:33. Everything was atoned for on the Day of Atonement. The day began by performing several animal sacrifices. A bullock for the High Priest and two goats for the people. 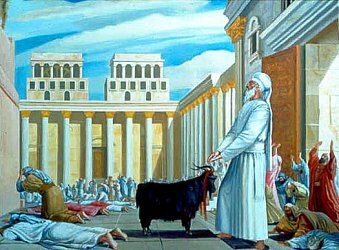 The bullock’s blood was taken into the sanctuary but this time it wasn’t sprinkled on the veil, it was sprinkled on the mercy seat covering the Ark under which lay the law of God. 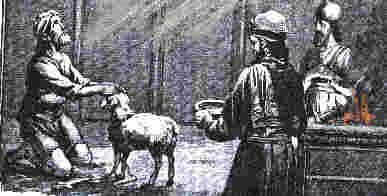 Then he would go back out to the courtyard and sacrifice one of the goats and bring its blood into the most holy place and sprinkle its blood on the mercy seat as well. All this was done to make atonement for not only the people but the sanctuary. “And he shall make an atonement for the holy place, because of the uncleanness of the children of Israel, and because of their transgressions in all their sins” Lev 16:16. He then applies the blood of the bullock and goat to the altar of incense in the first apartment and then on the altar in the courtyard, “reconciling the holy place, and the tabernacle of the congregation, and the altar” Lev 16:20. Finally, the remaining live goat is brought before the High Priest who bearing the sins of the people that had accumulated all year long in the sanctuary, “shall lay both his hands upon the head of the live goat, and confess over him all the iniquities of the children of Israel, and all their transgressions in all their sins, putting them upon the head of the goat, and shall send him away by the hand of a fit man into the wilderness” Lev 16:21. At the end of time, all the confessed sins of man-kind will be placed on the head of Satan who will bear the responsibility. He will be left in the wilderness of this world, confined by a chain of circumstances to this barren, depopulated planet for a thousand years. “And I saw an angel come down from heaven, having the key of the bottomless pit and a great chain in his hand. And he laid hold on the dragon, that old serpent, which is the Devil, and Satan, and bound him a thousand years” Rev 20:1,2; Jer 4:23-26.
and he that is holy, let him be holy still” Rev 22:11. The day of judgment will be over, all cases will be decided, all decisions will have then be made for eternity. But today is still the day of salvation! Our High Priest is still “faithful and just to forgive us our sins and to cleanse us from all unrighteousness” 1John 1:9. He received the right to forgive us our sins by shedding his blood on the cross in 31 AD in the midst of the 70th week when he, the Messiah, was “cut off” “out of the land of the living” Dan 9:26; Isa 53:8. He received the right to cleanse us from all our sins when he “received the promise of his Father” on the day of Pentecost 50 days later, Acts 2:32, and when “all power in heaven and earth” was given unto him at his ascension (Matt 28:18). The 70th week, starting with the baptism in AD 27, was divided into two 3½ year periods each ending with a death: Jesus in AD 31 and Stephan in AD 34. The 70 weeks were prophetically not just 490 days but 490 years. As the spies were 40 days in Canaan, so they would spend 40 years in the wilderness, “each day for a year” Num 14:34. Ezekiel was told to lay on his side 390 days for the years of unfaithful Israel, “each day for a year” Eze 4:6. So also the 2300 days of Daniel 8:14 were 2300 years. The 70 weeks, 490 years, were also 10 jubilees. Every seventh year the land was to rest and no crops were to be planted. After seven of these land rests another land rest called the Jubilee was kept on the first year of the next seven year cycle. Thus a jubilee would occur every 49 years. The only jubilee identified in scripture is recorded in 2Kings 19 and Isaiah 37, the only two chapters in the Bible that are word-for-word exactly the same. This jubilee was a double land rest in 702 BC when Sennacharib, the king of Assyria, besieged Jerusalem. Exactly 5 jubilees later (5 x 49 = 245 years) was 457 BC when the decree of Artexerxes (Ezra 7:7) gave full autonomy and financial support for the rebuilding of Jerusalem and the temple fulfilling Daniel 9:25. At the end of the 70 weeks, 490 years, 10 jubilees, the time “determined upon thy people” the nation of Israel came to an end on earth. This ending on earth coincided exactly 36 jubilees later (36 x 49 = 1764 years + 34 = 1798) with the end of the little horn papal power when Napoleon ordered the arrest of pope Pius VI in Rome on February 15, 1798. Taken to Avignon, France he died in captivity inflicting the “deadly wound” of Revelation 13:3; Dan 7:25-26. In AD 31 Jesus began his ministry as our High Priest in the sanctuary of heaven. Exactly 37 jubilees later (37 x 49 =1813 + 31 = 1844) he entered into the most holy place with his Father, the Ancient of days, and began his work of investigating his people, the cleansing of their temples, and those “who over-cometh…I will not blot out his name out of the book of life” Rev 3:5; Dan 7:10; Matt 22:11. Praise God! We have a merciful High Priest who longs to cleanse our temples and fill us with his own Spirit, his own Presence. 1Cor 6:19; Gal 4:6; Ps 139:7; John 14:18,20.